Hi, I am interested in your 1953 Chevrolet 3100 (stock #5098-CHA) listed on Autotrader for $33,995. I'd like to get more information about this vehicle and confirm its availability. 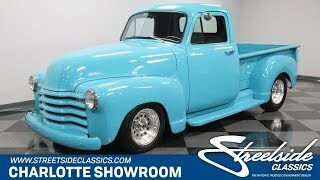 With a custom street-machine attitude, upgraded V8 power, overdrive transmission, and plenty of great details throughout, this 1953 Chevrolet 3100 is that kind of cool classic truck thats meant to be driven. The aqua blue on this truck is a great color to represent the optimistic 1950s. But you can also instantly see that this cool blue is more of a representation of how far this custom build has come, too. It has a modern look with the color-matched bumper, grille, running boards, and rear roll pan. And the lowered stance on polished racing-style wheels adds both flair and attitude. But even the updates still show off that vintage charm. For example, the expertly deleted trim really shows off the smooth design of these pickups. While the truck bed has been restored, you still get real lumber (its just a whole lot glossier now.) Inside is nice custom comfort with gray tweed cloth on the bench seat, door panels, and headliner. They all have Chevy bow tires embossed in them. Youll slip into the drivers seat and begin to notice your whole setup has been upgraded while still keeping classic style. Thats why you have a two-tone dual spoke steering wheel, bright tilt column, and retro-style AutoMeter gauges. This is made to be a comfortable cruiser, and you have an AM/FM/CD stereo w/iPod hookup hidden away so you get a vintage atmosphere but modern tunes. Youre going to love lifting the hood at car shows. Within the color-matched engine bay you have a tidy V8 with plenty of bright components. This is a 350 cubic-inch crate motor that the consignor states was installed in the last few months. It has all the right performance upgrades like a Holley four-barrel carburetor, aluminum intake, and a nice set of headers that feed the dual exhaust. Plus, its all supported by an aluminum radiator. And this was upgraded to be a great all-around driver, thats why you have power steering and a four-speed automatic transmission w/highway-friendly overdrive. This is the distinct classic that was built to run strong, so you know it has a broad appeal. Dont miss out on something so distinct and cool. Call now!